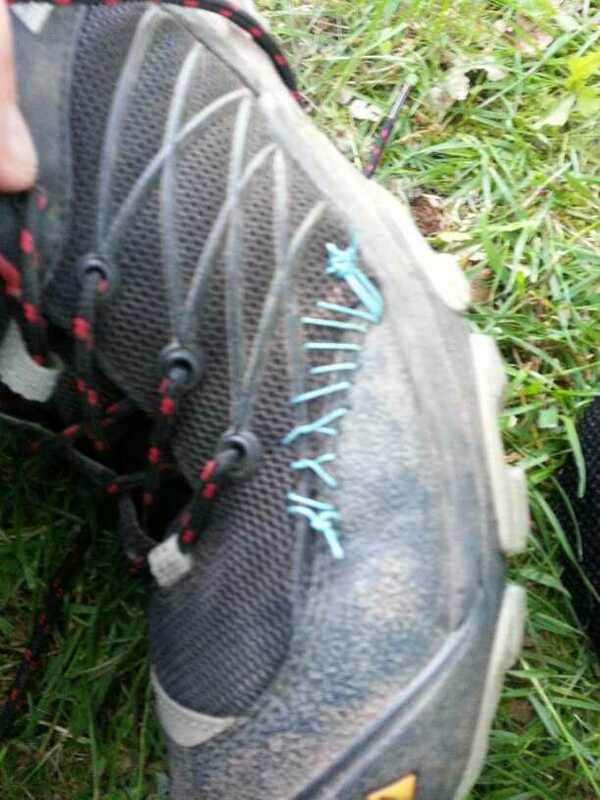 About 25km again with over 1000m of ascent (ouch!). A misty start from our small emplacement and an initial very steep climb up the valley side past a small chapel with views back to Conques. 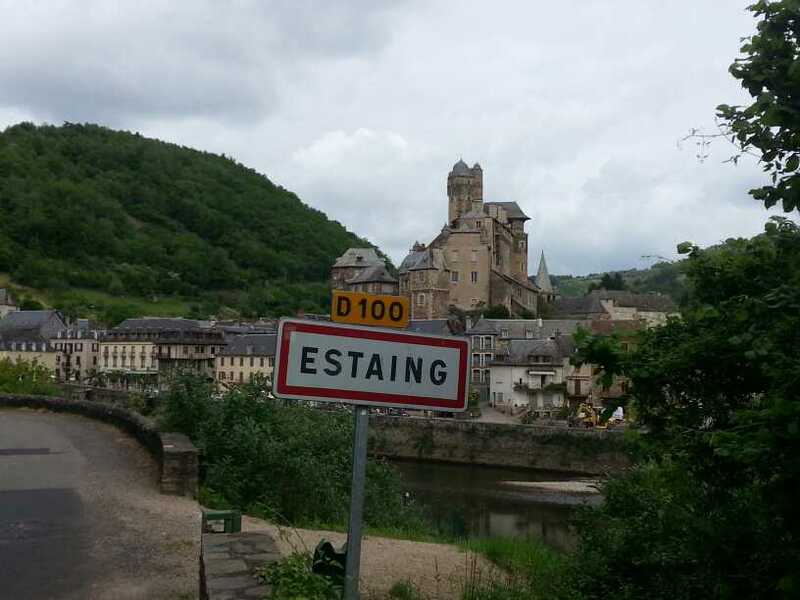 (Photo of 3 conques?). Weather dry and mostly sunny but luckily not too hot. Cows looked distinctly Friesian today except for an unexpected herd of water buffalo. The undulating path went through different types of woodland including a long stretch of sweet chestnut. We arrived in Decazeville by 14:30 in time for a much needed beer before Tim went to hunt for some more shoes to replace the onegs that look very poorly after only 2 weeks. Mission successful then we faced a final steep 2km ascent and another 2 down to arrive at another pleasant riverside campsite. 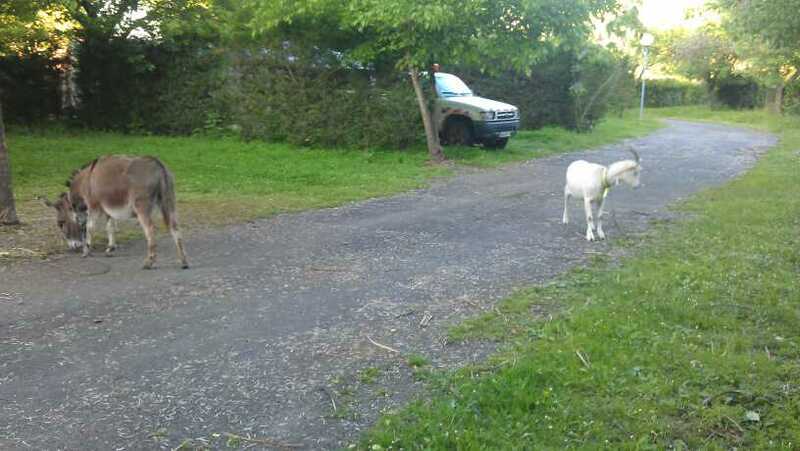 This time all the pitches have long grass and other occupants include a donkey, a goat, a duck, some chickens and a lot of rabbits (probably eaters not keepers). 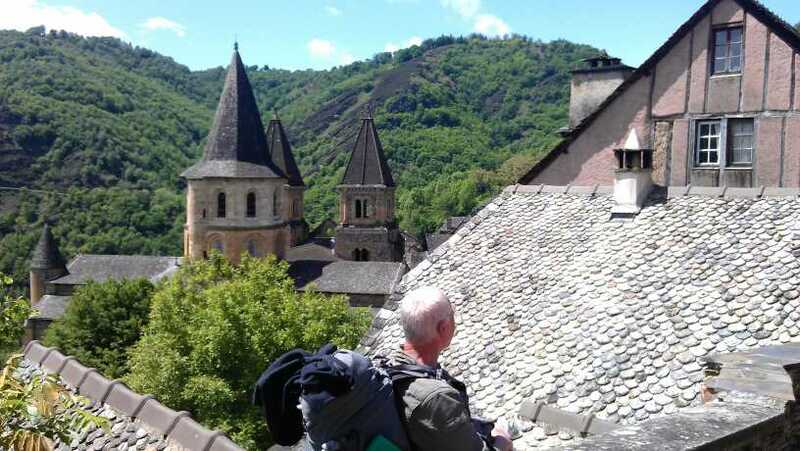 3 more days walking have brought us to Conques, a picturesque town which clings to a steep hillside and apart from numerous souvenir shops hasn't changed much since Medieval times. 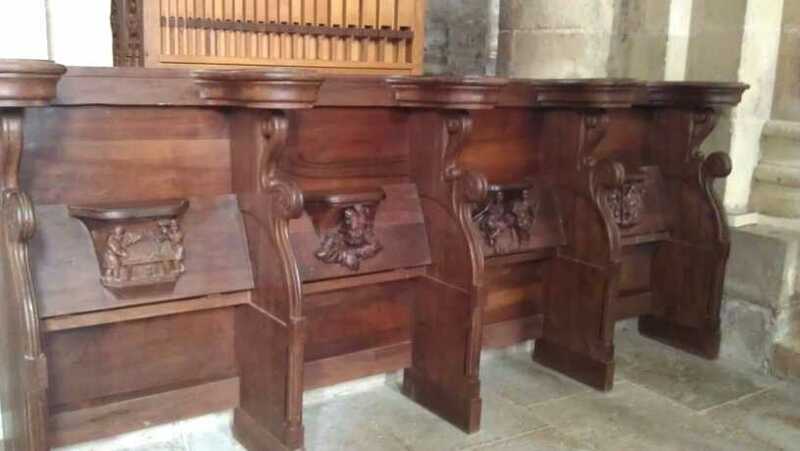 WIGS - it's the first place I've found misericords since Enville but they aren't as good! 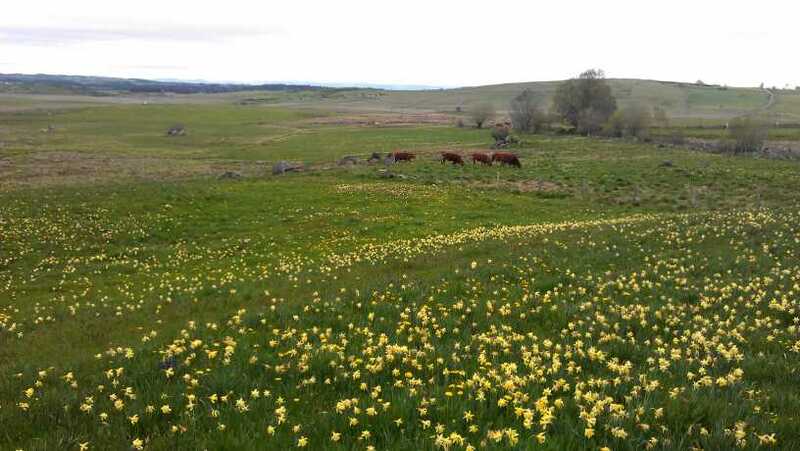 The scenery is still magnificent but sadly we have left behind the meadows of daffodils and orchids and the cows are less attractive than the dark-eyed aubrac beauties. 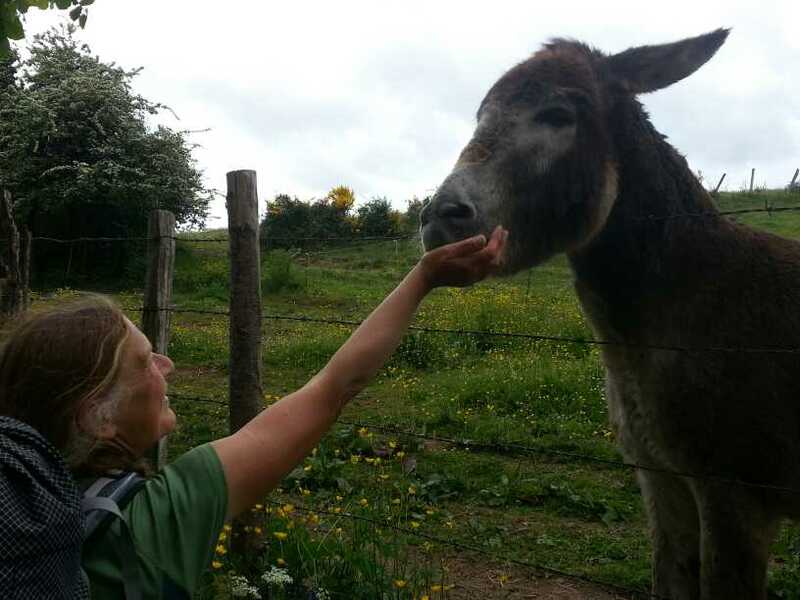 I made friends with a donkey this morning by giving it a sachet of sugar I had been saving for emergencies. 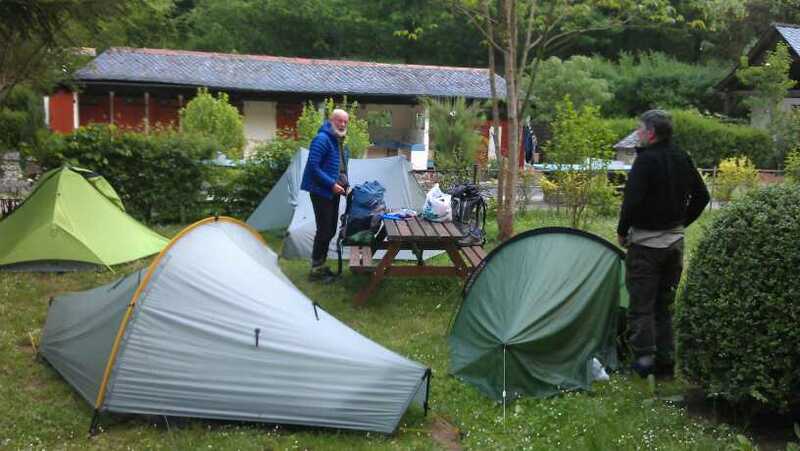 Our arrival at the campsite here was greeted by the worst weather we have seen yet - a sudden violent gust of wind swiftly followed by torrential rain and hail left us cowering in the toilet block. 15 minutes later the sky was blue again in every direction and the normal routine of tent pitching, showering and doing the day's washing resumed. 10.05.14 Sunday. 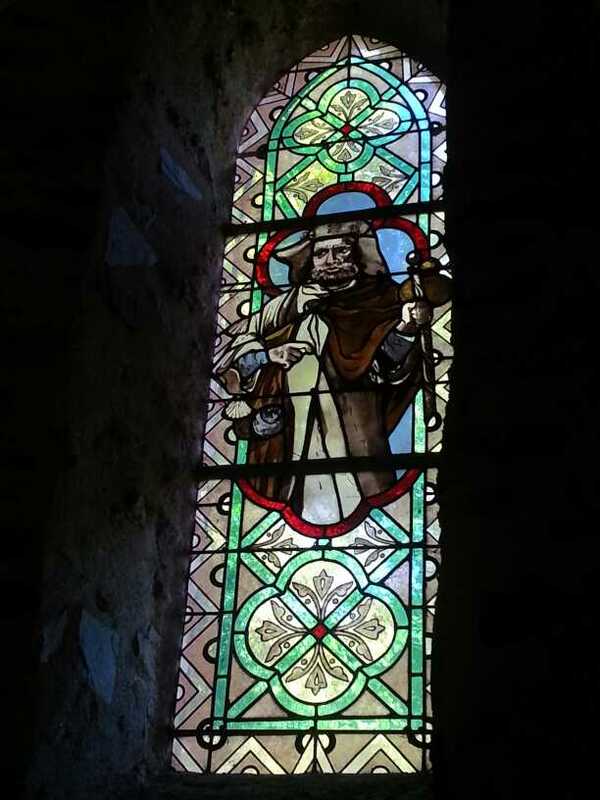 St Cheilly d Aubrac to Espalion. A night warm enough but with rain in the small hours sees us up and fighting fit except for Betsy complaining of a poor nights sleep due to Tims snoring. No one else heard anything but the stream and the rain. 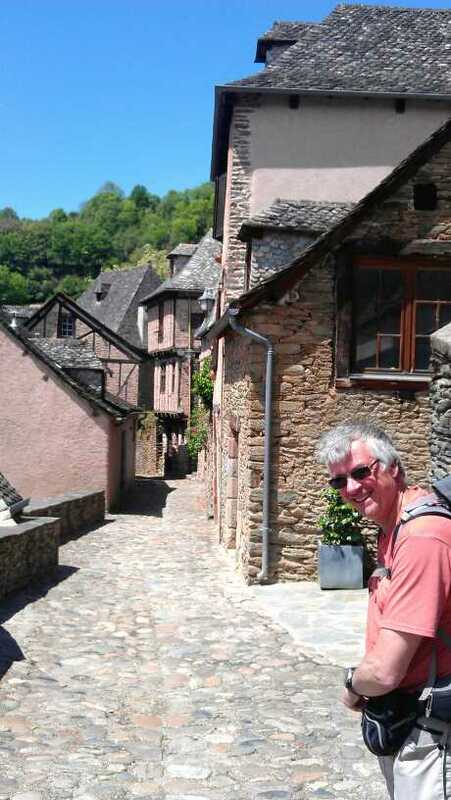 Yesyerday we crossed the departement boundary into Aveyron and the watershed in to the Lot valley, today after a lot of descent we croosef the Lot at St Clome d Olt a town with a twisted spire to its church and both Tony and Tim independently were pleased to note its membership of the society of bent spires of Europe! 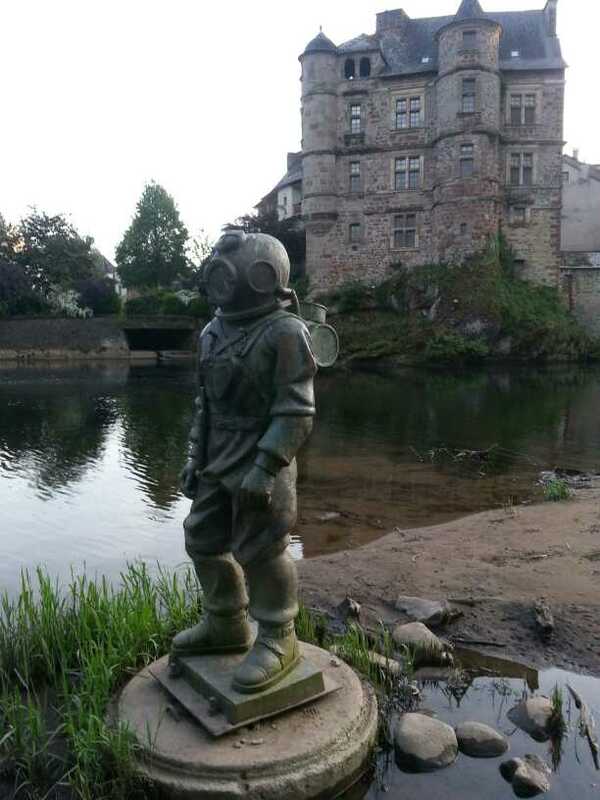 This does exist and we have seen some before, many of them were deliberately made with green wood to produce the imperfection that was felt more appropriate at the time for a tribute to their God. We find a bar open on a Sunday opposite the fountain just off the route through town it is full of walkers two young dogs playing and quite a quantity of flies, a bit worrying at this time of year. 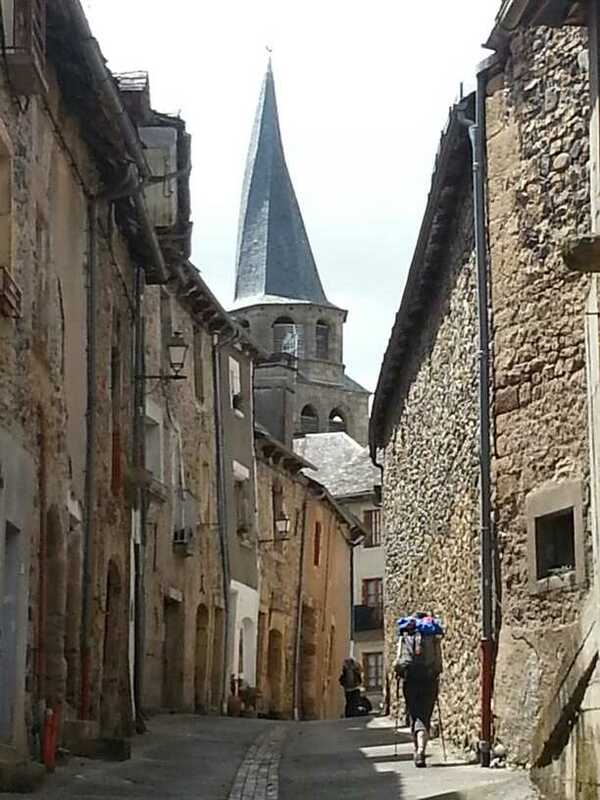 But the town is quite pictureque with a lot of old narrow streets. 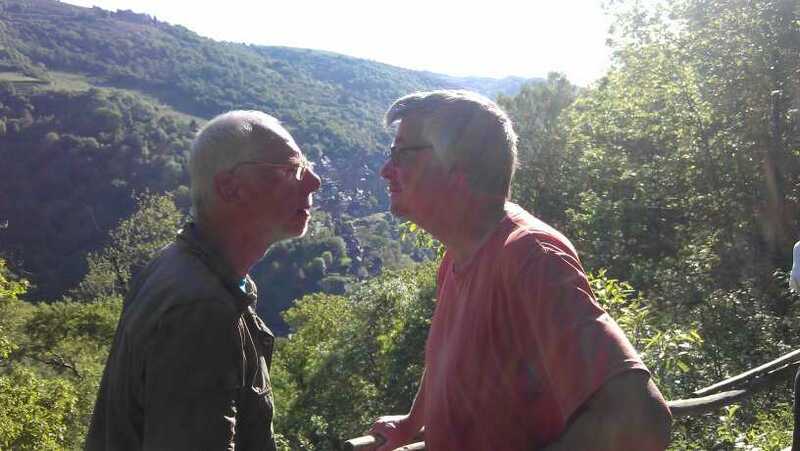 After crossing the Lot and leaving the Sunday quiet streets behind we part company and Tony Ray and Geof haul themselves up a route via a Virgin on a hill and add a gratuitous 400m up and down a very muddy motor cycle cross route. Betsy and Tim amble by road into into Espalion finding the first sicnificant roaf kill for Betsy' s cauldron. On arrival the bad news is the campsite opens tomorrow! The Gite d etape communale has beds and so we have an expensive night at 20e inc petit dejuner, it's not even cold as an excuse. 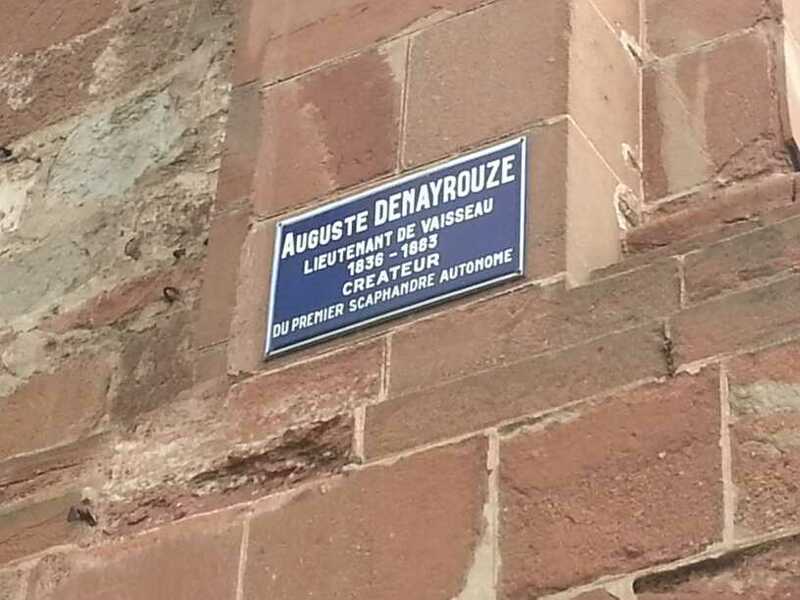 We discover that the town claims ss it's famous son a Luitenant Denayrouze who invented the first independent diving machine which was trialled in 1864 in the River Lot. A meal in a pizzaria is excellent but the kitty yet again needs feeding. 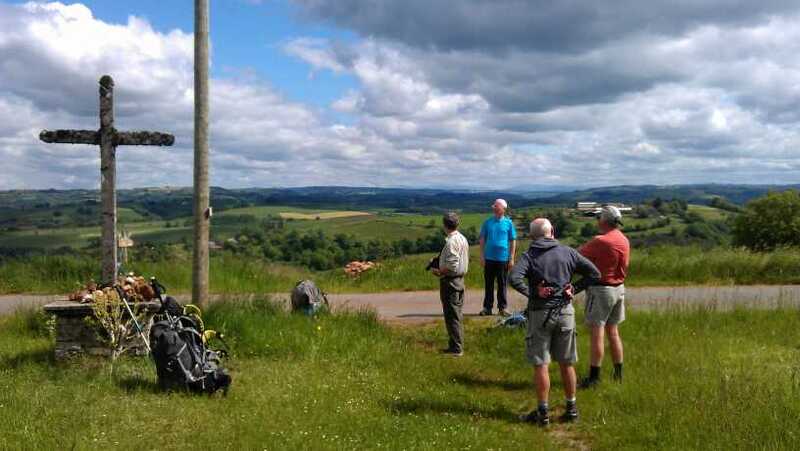 A shorter day, about 17km, really enjoyable walking. 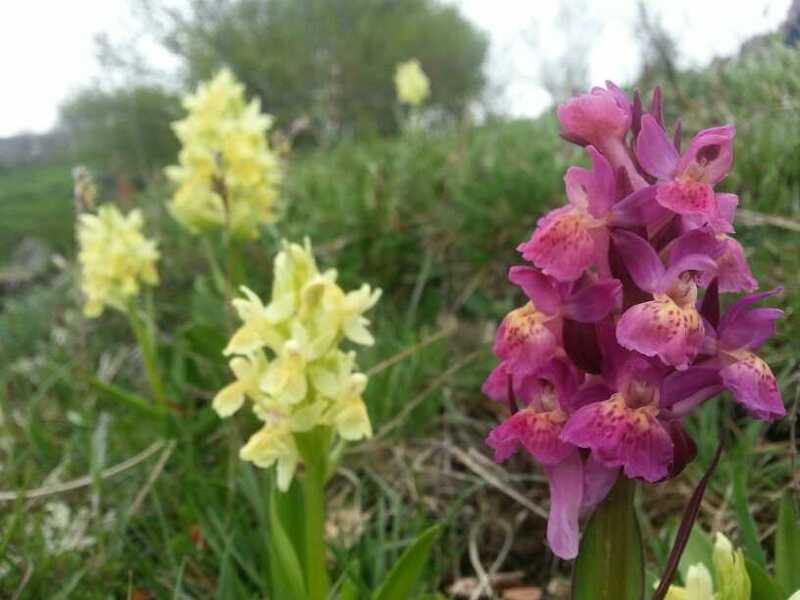 Fields full of mixed purple and yellow orchids and a charming little mouse peeping out of his hole and allowing photos. 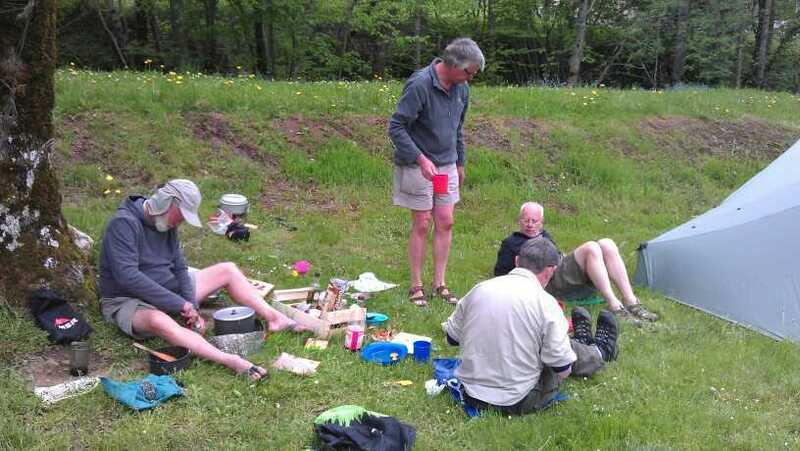 Tonight's campsite in St Chely en Aubrac is in a valley bottom and very comfortable so after a bit of shopping and sightseeing we settle down to a couple of litres of wine and some cooking. 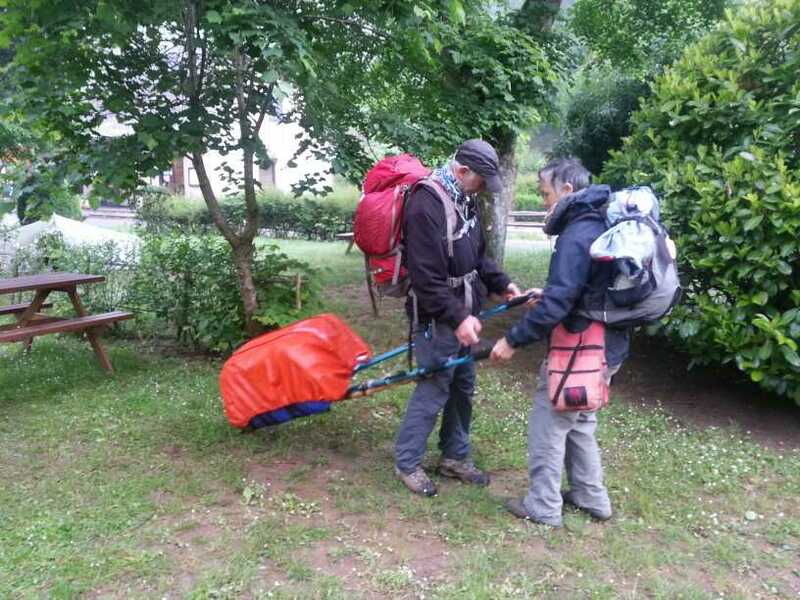 A carefully timed start to the day to allow farewis to Anne and Jane as they boarded the bus to Clermont ferrand, the first stage of their journey home. 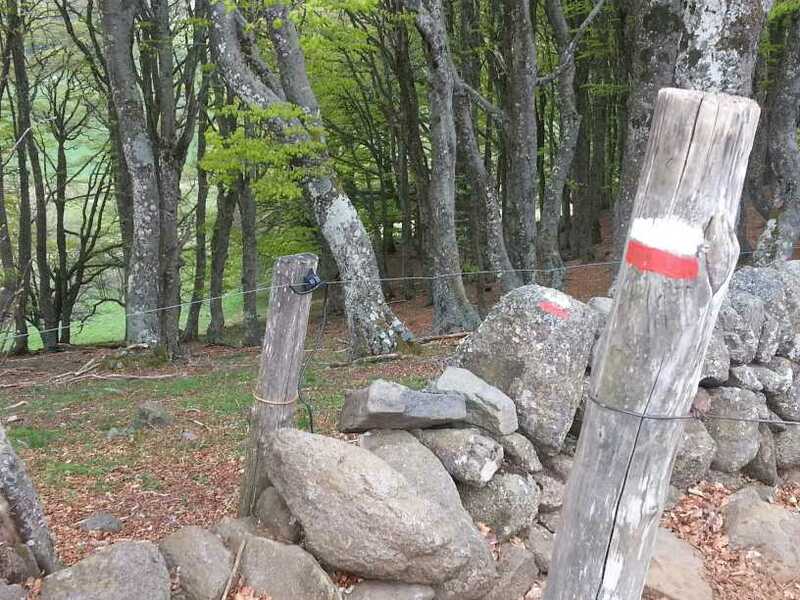 The remaining 5 of us did the longest day's walk yet, about 27km, ending up at the highest campsite yet at above 1100m. Luckily some cloud cover so it wasn't too cold. Magnificent wild flower meadows and of course the local cows with the dark eyes. The coffee stop provided very yummy flaky almond pastries to keep us going. A perfect walking day, dry and sunny. A late start to try and dry out the tents but early mist foiled that plan! Relatively short day at about 14km but still included over 500m of ascent. 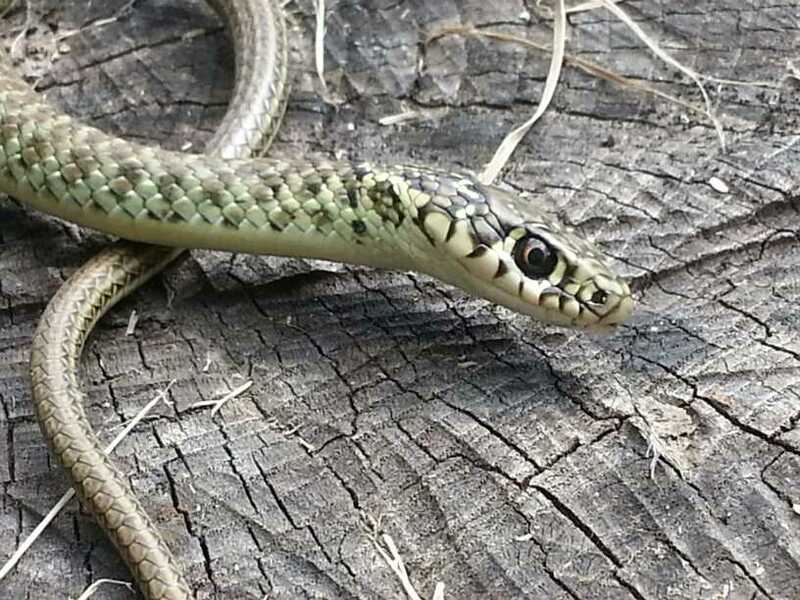 Several more sightings of Camberwell beauty butterflies and a good selection of birdis - red kites, cuckoos, pied flycatchers, 2 hoopoes and also 2 peacocks in a cage at a remote farm. 10.05.14 Saturday Nasminals to St Chiely. 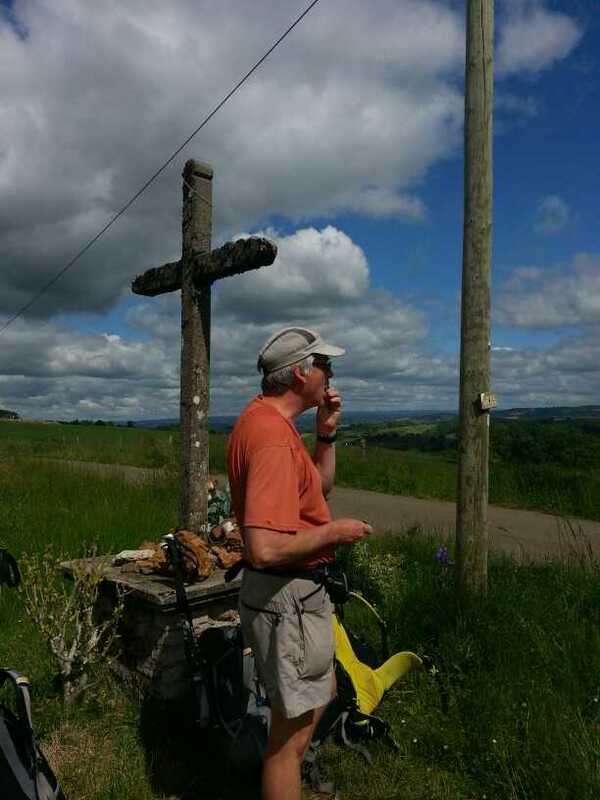 Last night we arrived at the campsite about a km out of town and found it open and with a comunal area that is warm and useful however the french youff on his 250cc bike zooming along the footpath at the edge of the site was less than spiritually up lifting. He was fortunate he gave up for his tea before we placed Tim's washing line at neck level on his track. Afraid we are old geysers who want our rest. 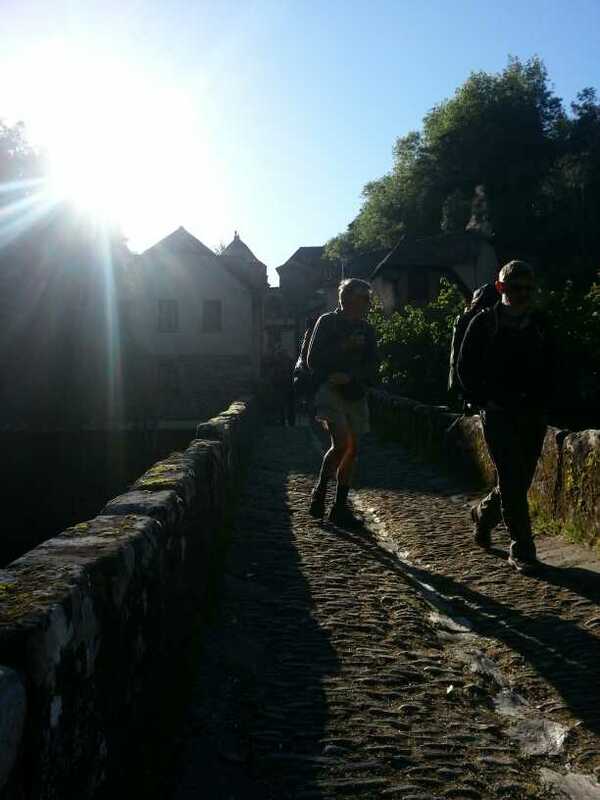 A reasonably warm night inspite of the altitude and a misty sun appears briefly at 6.30 we walk back into the village to get pastries and bread. 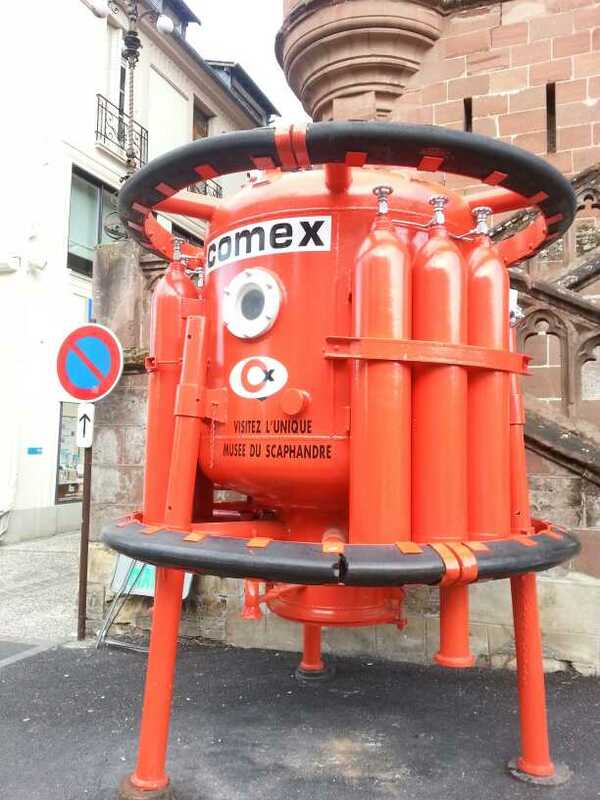 We brew up on the trusty MSR petrol stove and are admired by all those passing from gites in the village. Most of whom we pass again on the route that once again follows a line over grass just getting into its growth spurt. We see a good few of the 2000 odd species of plants covering the area. 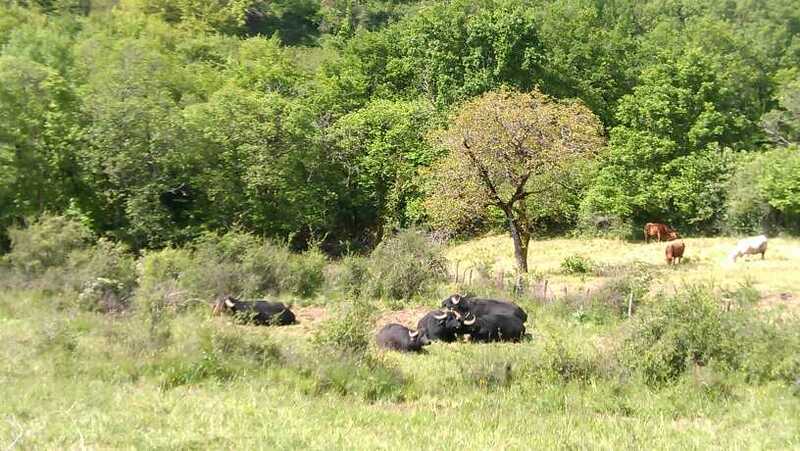 The invasion of cows from the lowlands, has not yet occurred and this traditional transhumance is scheduled for 2 weeks time when a few thousand people will flock to the area for the ceremony. In the meantime orchids cowslips and a host of other plants remain uneaten and untrampelled. 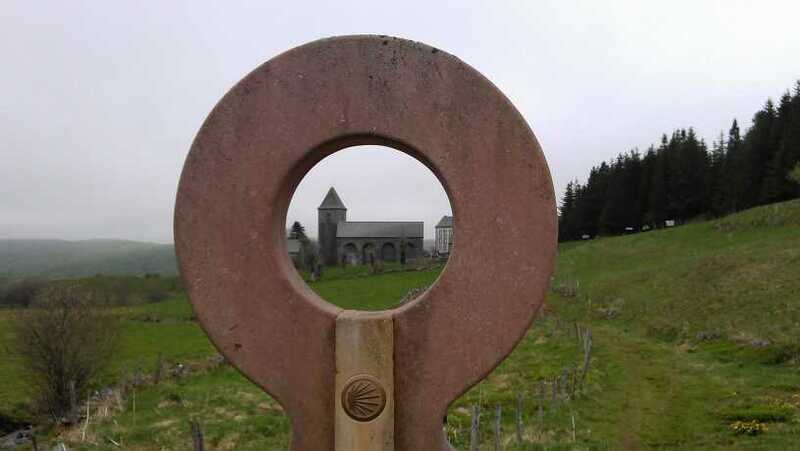 After 3or 4 hours we descend a little to Aubrac the site of a pilgrim hospital in the Midfle ages and still a religious retreat today. The cafe there has a selection of pastries that we have to beat Geof off as lunch in an upland meadow is only half an hour away. 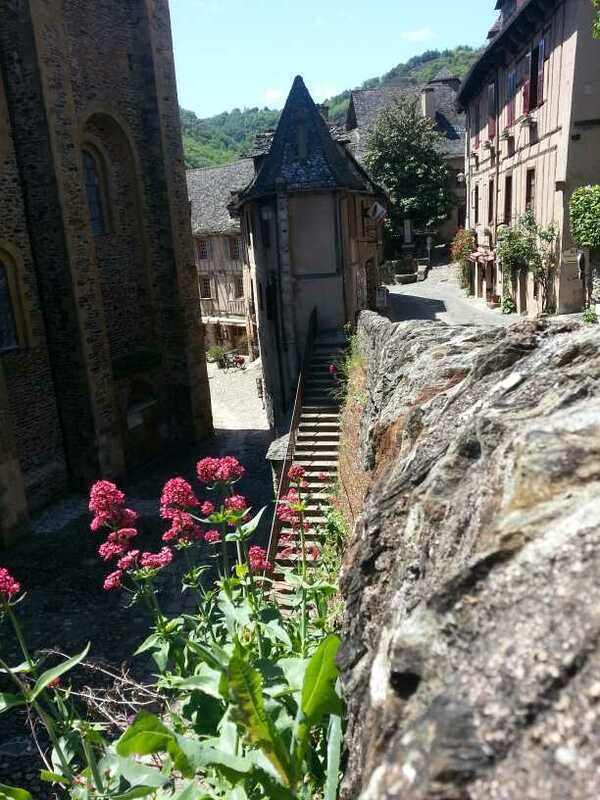 The orchids roll by and we descend into the vallegy of St Cheilly in the departement of Averyron. As we go down time seems to speed up to normal as we pass through the zone of dandelion flowers into the area where they have already clocked off. Occasionally rough the way is well graded and we tramp on down to the campsite at good speed except for Geof who's ankle is giving problems. Still it doesnt have far to go for this part of the trip. It is also time to thank those who have made, soldier or donated kit for the trip. 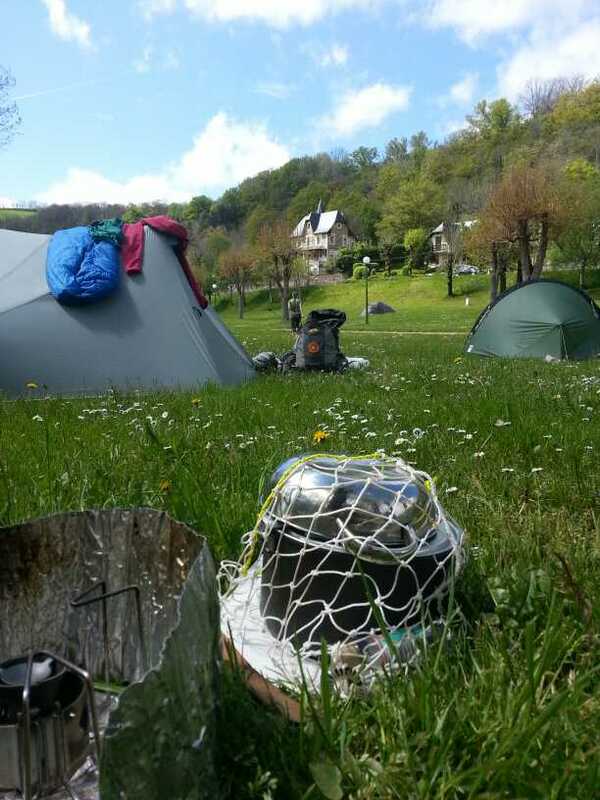 First thanks to Andy M for the macrame bag for the pans then thanks to Gemma and Mark for sorting Tims shoes a second Camino started with a whingeing Tigger would be too much and finally Henry Spires for a tent that seems to be ideal for the trip. 18km 500m up 850m down.